← Special-Needs Students, College and the Most Special, Not Needy Student of Them All! I’m making a fresh batch of pink Himalayan crystal salt sole! Sole (pronounced so-lay) is made from Himalayan salt. 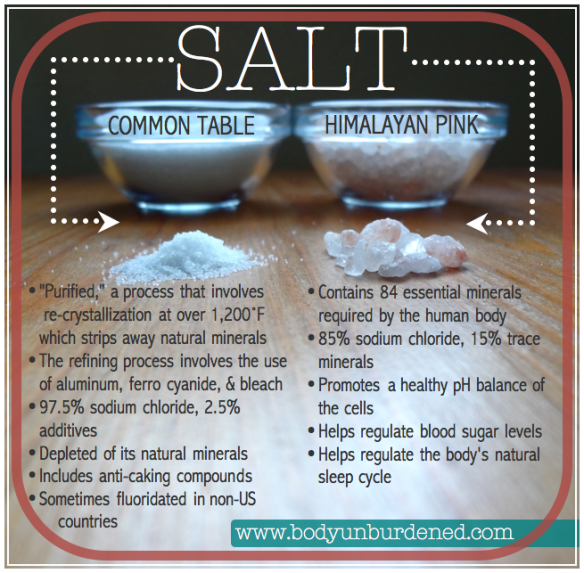 This beautiful pink-coloured salt, mined from the Himalayan mountains, contains 84 minerals. 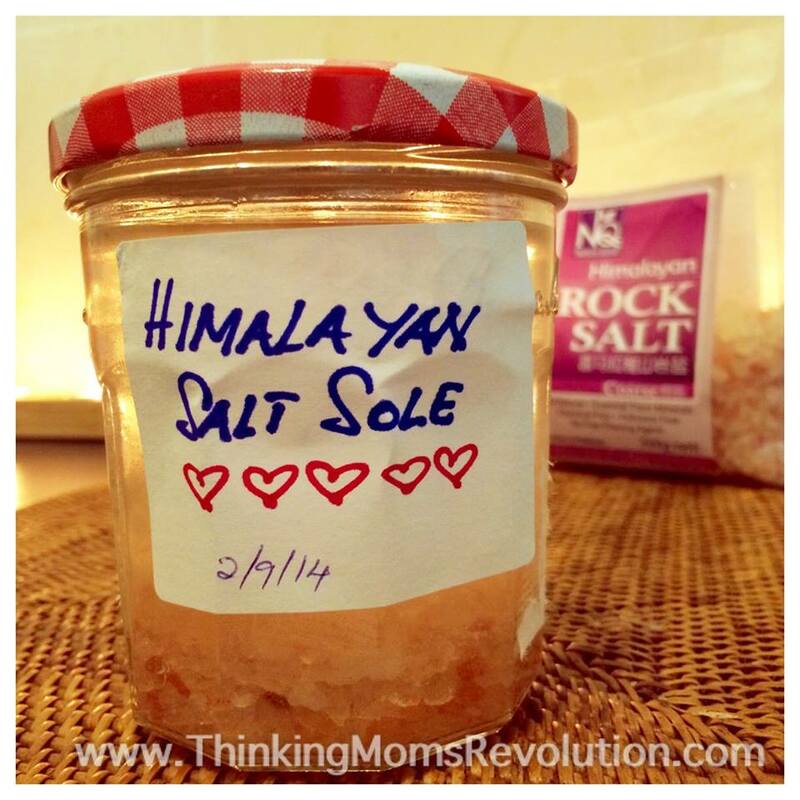 When you dissolve Himalayan rock salt in water, to the point of saturation, that salt water solution is called sole. In German, the word sole, which is derived from the Latin word “sol,” means sun. Sole means fluid sunlight or fluid light energy. My family and I take sole for our daily mineral needs. My leg cramps, restless leg syndrome and muscle twitching disappeared after 2 days on Sole. Previously, I had to take huge amounts of Magnesium glycinate or frequent doses of homeopathic Mag Phos. My eldest daughter’s teeth grinding also stopped once I gave her additional sole. Teeth grinding can have many causes, please read my blog Natural Remedies For Teeth Grinding: It’s Not Just Stress. What Does Sole Taste Like? Sole tastes just like salt water or ocean water. 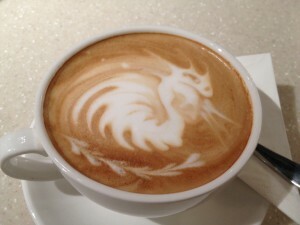 It can be a bit too salty if taken straight, I usually dilute the saltiness to make it easier to drink. One teaspoon of pure sole in a small glass of water is perfect for us. Even my older daughter, who is very sensitive to new tastes, is fine with it. I also like to add a few positive affirmations too. You’ve heard of the Rice Jar Experiment by Dr Masaru Emoto, right? For this batch of sole, I’ve added a few love hearts on the label. And I say ‘I love you’ every time I stir it. I’m basically infusing it with positive loving energy. My fellow Thinking Mom, Sugah, wrote an amazing blog on this. Please read Visualize, Manifest, Pray: Positive Affirmations To Surround Your Child With Autism. I dissolve 3-4 tablespoons of finely ground Himalayan pink salt in a little pail of water and add it to a warm bath. Himalayan salt clears away negative energy. It is good for adults and children who are very sensitive to negative energy or tend to absorb other people’s energies. I usually do this 2-3 times a week or after a particularly chaotic day. I also like to add White Angelica essential oil, as it also helps to clear away negative energies. New Moon = Cleansing. During a new moon, cleansing is at its peak, meaning the body’s ability to internally and externally detoxify itself is at its highest potential. There are so many types of salt available on the market. There’s regular table salt, sea, Celtic, kosher, Himalayan, even bamboo salt and many others. I no longer use conventional table salt. Conventional table salt is highly refined, bleached and processed. It is stripped of its minerals and offers no nutritional benefits. With sea salt, consider how polluted our oceans are nowadays. With oil spills, dumping toxic waste and garbage into our waters, I am cautious where I get my sea salt from if I do use it. Because of the pollution in our waters, there can also be trace amounts of heavy metals like lead. Depending on where it was harvested and processed, there are some beneficial sea salts too. Unless it states Himalayan on the label, rock salt can be mined and sourced from anywhere. So do check where it comes from and its purity. Himalayan salt is naturally pink, so it’s easy to distinguish from other salts. Unlike conventional table salt, Himalayan crystal rock salt is the purest salt and uncontaminated with any pollutants. It contains all of the 84 elements found in our body. When Himalayan salt dissolves in water, it results in a concentrated, electrically charged matrix of the 84 trace minerals in the salt. The ionic salt and trace minerals nourish each cell in our body. It is unfortunate that it has been instilled in us that salt is bad. But this refers only to refined table salt, and the high amounts of sodium in fast food, processed, packaged and canned food. High amounts of refined salt are bad for your health. Not all salt is created equal. Salt is a crystalline mineral made of two elements, sodium (Na) and chlorine (Cl). Sodium and chlorine are absolutely essential for life in animals, including humans. They serve important functions like helping the brain and nerves send electrical impulses. Salt is used for various purposes, the most common of which is adding flavor to foods. Salt is also used as a food preservative, because bacteria have trouble growing in a salt-rich environment. The reason salt is often perceived as unhealthy (in large amounts), is that it can bind water in the bloodstream and raise blood pressure. The great majority of sodium in the Western diet comes from processed foods. If you eat mostly whole, unprocessed foods then you don’t need to worry about adding some salt to your meals. 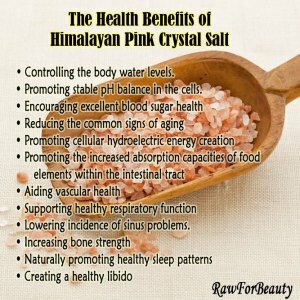 Pure, hand-harvested, mineral-rich pink Himalayan salt is actually healthy and beneficial for you. Himalayan salt is very affordable and is available in most supermarkets, check the organic section. I now use sole for our daily minerals, we no longer need to take calcium, magnesium or zinc supplements daily. I believe sole can benefit everyone, including children with autism, eczema, allergies and many more. Everyone has different mineral needs, so you do need to consider you and your child’s unique issues, nutritional needs and underlying medical condition. Himalayan salt sole is best taken first thing in the morning, but I’ve taken it at other times of the day as well. It’s truly fuss-free. Don’t forget to drink lots of water and stay hydrated. I take 1-2 teaspoons of Himalayan salt sole daily, I also use Himalayan salt for cooking, and bathe in it to wash away negative energy. 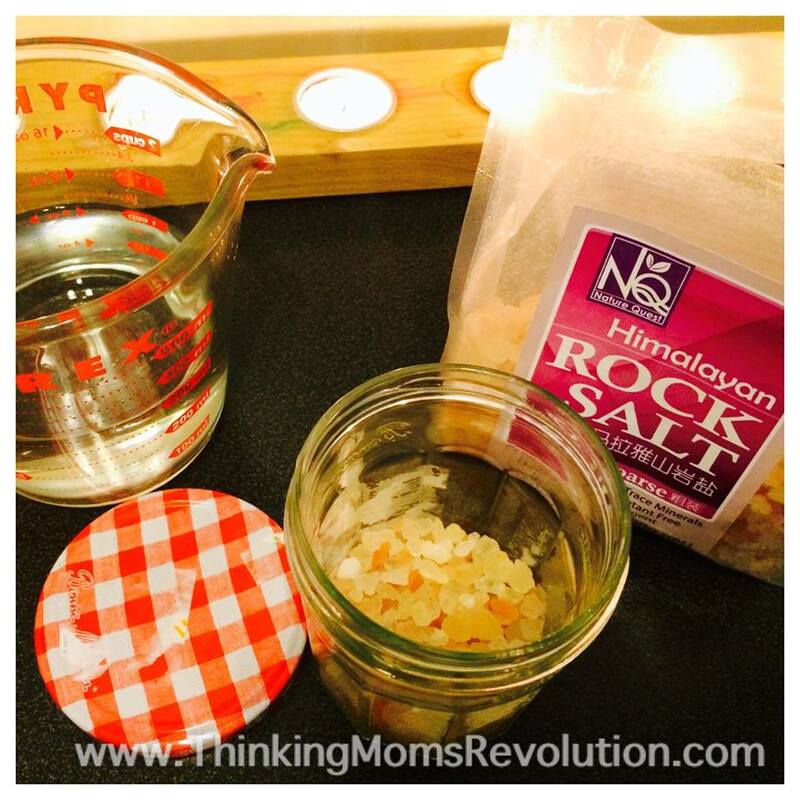 I always have pink Himalayan salt in my home; it is so versatile. Make your own sole today! 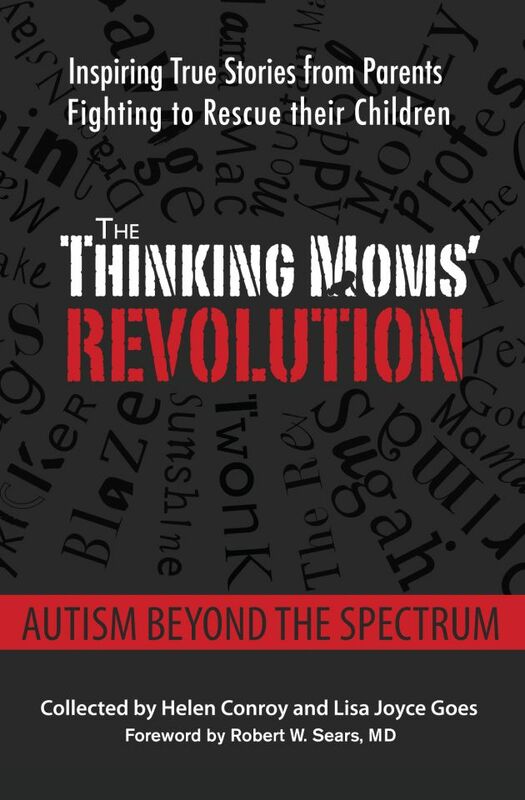 The Thinking Moms’ Revolution is very excited to be presenting a powerful line up of six internationally renowned speakers on the health effects of pesticides, food allergies, the gut/brain connection, and the nutritional pragmatics of cooking for special diets for the whole family. To read more about GMOs, Organics and Food Allergies: How To Feed Your Family Without Losing Your Mind eConference and to register please go HERE. 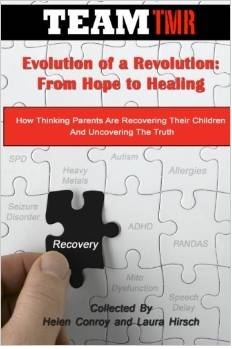 About the author – Dragon Slayer is a mother of 2 children who are now recovered from autism. 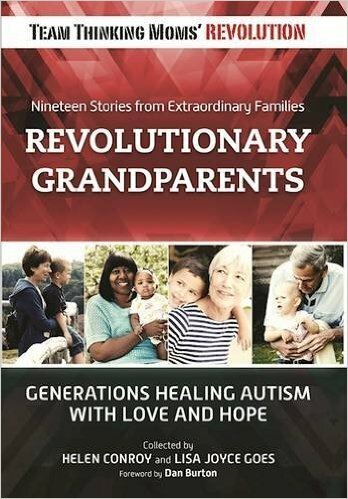 She is the Vice-President of The Thinking Moms’ Revolution, co-author of Autism Beyond The Spectrum and founder of KL Biomed, a support network for parents with children affected by autism, ADHD and related disorders in Malaysia and neighbouring countries in Asia. She lives in Kuala Lumpur, Malaysia. For more by Dragon Slayer, please CLICK HERE. This entry was posted in Dragon Slayer TMR and tagged 84 minerals, autism, himalayan salt, leg cramps, muscle twitching, sole, teeth grinding. Bookmark the permalink. Wow, thank you so much for sharing this knowledge! Good Read & glad I stumbled upon this! Thank you for writing this. I know you have written this long time ago. My son grinds teeth soo hard at nights. It has become more this past month. I am going to start with the Sole for him and then try the other stuff. We already do the diatomaceous earth for him two weeks in a month – once during the new moon week and once during the full moon week. I also have teeth grinding issue according to my dentist. I am hoping the Sole will help me too. I’d like to know how the Himalayan Salt Sole affects one with hypertension aka high blood pressure before trying it. Where can I buy Himalaya salt in KL/PJ? I got recommendation from my friend who said it was good for migraine, I suffer serious migraine attacks every month. Please advice and appreciated your comments. Hey cj, I am not exactly where KL/PJ is. The only KL I know of is Kuala Lumpur, but no matter. Seriously, the easiest way to get it would be to just order it online. Just do a search, and watch the list populate. I usually go through Amazon. I found it , thanks. I will start taking it tomorrow morning with empty stomach or my first drink after I woke up, a tsp with 8oz water,is it correct? I buy coarse pink Himalayan salt., taken from the Highest Himalayan mountains, from many places, even Target & similar stores. Also from my chiropractor. I’ve known about table salt for years. Never touched it-Knowingly. & craving more & more bad salt. There’s a medication called Iodoral which is more about the iodine deficiency in regard to hypothyroidism in conjunction w natural salt. Hi Elaine, for the images and stories I have seen, it is harvested by hand using hand tools. No big mining machines. It is also said that due to the negative ions that H salt produces, these miners are the happiest miners on the planet. I have been using Pink Salt for years in the kitchen. We also have a large Pink Salt crystal which is now a wonderful night light. It has only been a couple of months since I have been taking my daily dose of sole but I can definitely see and feel the benefits. However, the greatest benefit is also the one that is the most amazing. I have read anecdotal accounts as to how sole with stimulate follicular and nail growth. Folks, I kid you not, this is true. I am 63 and like a lot of guys my age, I have that kind of bald spot at the crown of my head. Now mine is not outright bald, but it was definitely getting pretty thin. I have had the same hairdresser for years so he knows my hair and had been cutting it to cover the thinning as best as he could. I usually get a haircut every 2 1/2 months or so and had just gotten a haircut before I started on the sole. I started taking the sole and after a month I was feeling my hair after a blow dry and darned if it did not feel thicker and fuller. I went to my wife and daughter and they were amazed. Yes, they could feel the difference. And finally a month and a half later, I went back to my hairdresser and he too was amazed and concurred that, Yes indeed, my hair was much thicker. Now, at this point, it has done nothing for the receding hairline, but we will see. I know that some of you ladies also ahve that thinning hair going on and there is no logical reason that if it worked for me, it will work for you too. I am also a lifetime nail biter. I know exactly how long it takes for my nails to grow. My nails are now growing in thicker and noticeably faster. Maybe twice as fast. And, as an added benefit, I have dropped 12 pounds, my sleep cycle is much more sound, and my wife is loving my libido. Folks, this stuff is real and I highly recommend it to all of you. Is a Ball canning jar and lid appropriate for making sole in? Should it only be combined with plain water, or is a little lemon, lime, or cranberry juice added in good too? this was a very great help to my science project I thank you so much you helped a lot. I am greatful that this website was made. thank you so much. I drink 1 tsp of sole mixed with an 8 oz glass of spring water. Immediately when I wake. Then Wait about 10-15 mins before eating or drinking anything else. I went to a salt cave and they told me how to use it as well as reading many articles , you want to get those minerals in first thing and enjoy the benefits. It lasts 24 hrs. If you used a metal spoon does it ruin the whole batch? I forgot. I have been drinking the sole every day for the past three months. I have more energy, I’ve lost 18 pounds, my skin looks healthier. One thing I would mention is that you don’t use anything metal with the sole. No metal lids or spoons. I use a wood spoon with mine. I would recommend this for everyone. I will be sharing this article with my friends and family. I forgot to mention it is curing the awful sinus infection that has been terrorizing my life for the last 12 years. I no longer wake up to sinus headaches every day! I love this stuff. It has truly changed my life. I mindlessly stirred my sole’ with a metal spoon. Is it ruined? to the jar all the time as and when needed, no need to discard. I have made this with both fine and course flake Himalayan pink salt and it forms a pink sediment at the bottom of the jar in the water. Can you tell me what that is and should I mix that up and drink it within the teaspoon I drink everyday or leave it there and discard at the end? I have also heard it’s important to get this salt from sources that do not use metal extractors. How can you know the extraction method and how important is that? Ok I don’t get it, with this salt. How you drink it and it’s so salty. So do I need the hole bottle and little salt. I got everything just don’t get it. All the salt and then water. Every story I read is different. I’m confused about this . I have a illness lupus and some of the sign I here it’s suppose to help. I’m confused all this salt and water it’s not good for you. Water 1/4 and then salt, how much himalaya salt do I use with the water. Did you get an answer to you questions from any of the comments or are you still confused? I can add my comments but don’t want to be redundant. My search for remedies for grinding teeth brought me to your page. My daughter has been doing it for months. As I read this page, I recalled my accidental experience with adding a granule of himalayan salt into my water bottle to make the water taste nicer like mineral water. The next day, my lips which had always felt dry no matter how much water I drank, looked plump and healthy. They used to look dark and pale. Since then I have been adding more sea salt to my food because I thought my body was lack of salt. Thank you so much, I will make Himalayan salt sole NOW for my family. I’ve been using sole for quite a while now and the benefits are truly amazing. As a Nutritionist, it’s something I’ve been sharing with my clients, but as a Mom…well, I’m certainly going to give it a whirl for my son’s teeth grinding. Thanks for the tip! Thank you! Thank you, question though, is it ok to use fine grain pure Himalayan pink salt? Awesome, Dragonslayer and something I have been planning to do, so your post was timely! I want to add from my learning in the NTA course is that water needs to be sipped throughout the day, not chugged. It can actually be dehydrating to drink too much at once. So I can only imagine that sips of water throughout the day with the sole would be extremely beneficial! Thank you Julie! Yes I space out the sole throughout the day rather than drink it all in one shot too.